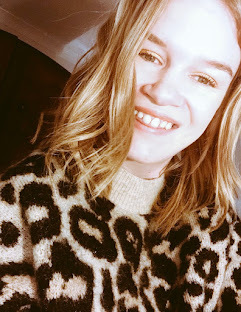 I am writing this blog post in the beginning of July as I will soon be on my holiday and wanted to upload a few blog posts just before I go. When you read this blog post it will be the middle of July and I will be nearly ready to go. I have not blogged about Rita Hayworth before and thought this would be a great opportunity to share a blog post dedicated to her. The picture I found of her represents what I think an elegant lady should be and was. An example of another elegant classic lady is Audrey Hepburn. Unlike any Old Hollywood Star blog post I have done I found out some really interesting information that I wanted to share with you before I begin to talk to you about this lady. This is technically a get to know Rita for me and maybe for some of you. Of course I know a lot of people who love Rita will know of all this, possibly not everything. An insight to Rita's life. Rita Hayworth had something. And by something, I mean everything. She was a little girl from Brooklyn, who was exploited at the hands of her domineering father, forced to change her name and her hairline. She was gorgeous but so were many Classic Hollywood stars. What sets her apart is the alacrity in her eyes, the persistent bounce in her step when you seen her onscreen, it seems like everyone else is just sleepwalking. But Hayworth's story is also a tragic one; in addition to undergoing a very public and very graphic image of her heritage, she also endured mental abuse and manipulation at the hands of multiple men. But Rita managed to show her talent in the 1940s with a man who was not her husband at the exact time when Ingrid Bergman was busy being denounced on the Senate floor as an 'instrument of evil' for doing the same thing. Hayworth's man was not only not her husband but he wasn't even Christian! He apparently was a Muslim. This man was a prince, and Hayworth would be made a princess, it was somehow forgivable. She had endured a life of transformation and heartbreak, all of it very much in the public eye, and so there were things that the audience wanted for her - happiness, a family, a princess that made them willing to forgive pesky technicalities. But the lustre of royality did not last and Hayworth moved on to a string of modern hits, to more husbands, to relative obscurity. But for a brief period in the late ‘40s, she was the closest thing America had to a Cinderella. 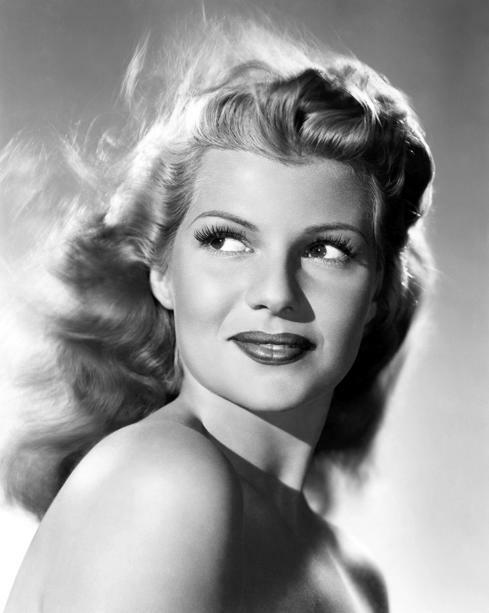 Rita Hayworth was born Margarita Carmen Cansino, in Brooklyn, to two showbiz parents. Her father, Eduardo, was a Spanish dancer; her mother, Volga, had been a Ziegfield girl. (Ziegfield Girl = Chorus Girl. Margarita’s grandfather had been a HUGE DEAL in Spanish dancing — he brought the bolero to American audiences and it was he who gave Hayworth her first dance lesson at age three. 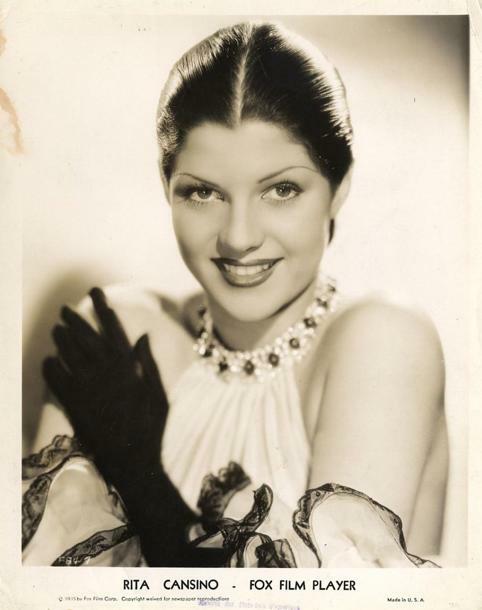 From then on, Hayworth was in constant dance training. Her family moved to Hollywood when she was eight, and her father began giving personal lessons to big studio stars. But the Depression tightened belts both in and outside of Hollywood, and dance instruction was one of the first luxuries to go. But Eduardo Cansino had a plan: he would make Rita his dance partner, and they could go dance in Tijuana clubs as “The Dancing Cansinos.” Nevermind that this arrangement suggested Rita to be her father’s wife — the pair was a HUGE HIT. And it was in one of these Tijuana nightclubs that Hayworth was spotted by a talent scout for Fox Studios, who quickly signed her, under the name Rita Consuelo, to a six-month contract. But Consuelo was nothing special, at least not yet. She appeared in very small parts in a number of very small films, and at the end of her six month contract, Fox unceremoniously let her go. At all of 18, she eloped to Vegas with Edward Judson, a businessman-turned-talent-manager as old as her father. Judson helped land Consuelo a string of bit parts, eventually winning her a screen test with Columbia Pictures in 1937. Columbia signed her to a seven-year contract, but Consuelo spent her first months with the studio typecast as sultry, dancing (bit-part) Latinas. Columbia wanted a new star, someone to rival MGM’s glamour. But to turn Cansino into such a star, drastic measures were apparently necessary. Rita Hayworth died in May 1987 at the age of 68 with complications as know today as the Alzheimer's disease. How do you de-Latinize a beautiful woman? Take away her widow’s peak. And get rid of her black hair. Cansino went into seclusion, underwent extensive hairline electrolysis, dyed her hair flaming red, and re-emerged as Rita Hayworth. What’s most remarkable about this transformation isn’t how blatantly racist it is. Rather, it’s that it wasn’t a secret. Columbia didn’t try to cover up what it was doing to its star; rather, they publicized what had happened. Of course you can find more information about her career and life but there is so much about this lady its unbelievable! I hope you have enjoyed reading about Rita Hayworth as much as I have. Whilst I am away I will NOT be posting instagram pictures or using my facebook or twitter. I'm pretty much having a week of sunbathing and relaxing then using social media. You can check out recent pictures/more blog posts, tweets on my social network accounts.